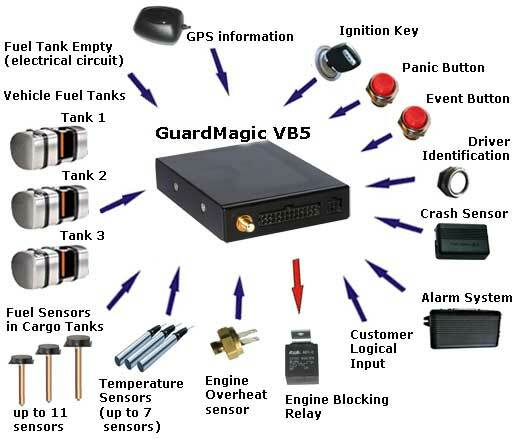 GuardMagic VB5 is a special tanker-truck GPS/ GSM-GPRS module dedicated to use on tanker-truck application. Module is intended for remote monitoring fuel level in compartments of fuel trailer (semi-trailer), remote supervision of tanker-truck movement, monitoring of tractor (track) fuel consumption and tanker-truck status. Module supports up to THREE regular fuel tanks and up to ELEVEN cargo tanks (cargo compartments). GuardMagic VB5 is a special module for the road fuel tanker application. (GuardMagic VB5 modules support GuardMagic universal communication protocol that's allow to have different GuardMagic modules with different functionality in one system). Status of external logical circuits (logical input, "Event Button").